Autostacker re-envisions what your garage could look like from the top down. Its sole purpose is to double the parking capacity of a single parking space, yet nothing like Autostacker has ever existed in home or commercial markets. Why Autostacker? Smart homeowners look to get the most value out of their space. For instance, a family might use bunk beds to increase the value of their kids’ bedroom. By having two kids share one room, another room is freed up for other purposes, thus maximizing the potential value of the house. Pretty simple, right? That same family might be looking to get more value out of their garage. Overnight, Autostacker will increase the value of a garage by “creating” additional square footage. That overhead space is just being wasted anyway, so you might as well use it! Autostacker is more than just a garage upgrade: it’s a total lifestyle upgrade. Sure, there are other ways to increase your garage’s square footage and fit more vehicles, such as a property expansion. However, while an expansion will increase home value, it almost always costs more than it returns. Studies show that home garage expansions can recoup 63% of what you put into them, and an “average” garage build costs over $50,000. Luxury garage expansions cost significantly more. In comparison, Autostacker’s costs are meager, yet the end result is equally effective. Whether you’re a high-end car collector or just need extra space for the family wheels, Autostacker barely takes up more room than a single parking space and does not require in-ground bolts or special flooring to install. With multiple lock positions, even tall trucks and SUVs are incredibly easy to park in the lower-level space. Autostacker’s smart design also allows tricky, hard-to-stack cars like Corvettes, Lamborghinis, Ferraris and Porsches to drive on without risk of scratching the front end. 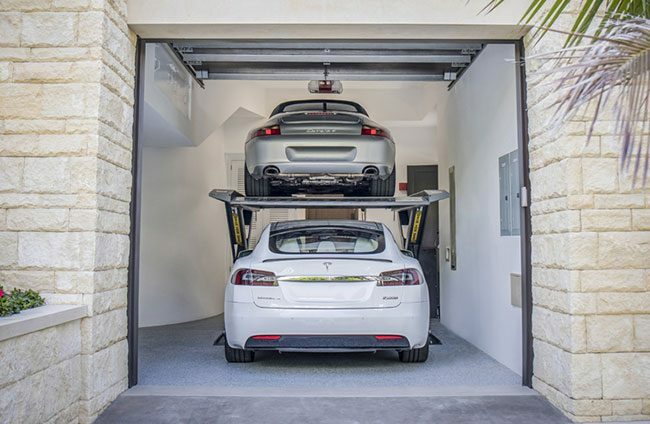 Two short autos will stack in virtually every garage, regardless of ceiling height, so if you’ve always wanted to showcase your entire car collection without making an unsightly mess, there’s finally a way. Autostacker saves an incredible amount of space while maximizing your parking. It’s simply amazing.